The species in the rack changes as we sort lumber every week or two, quantity varies from week to week. Sometimes we have some lumber that isn't top grade but is still pretty good. 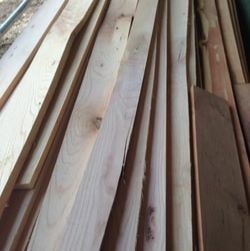 Right now we have some poplar, sycamore, red oak, cherry and a few ambrosia maple boards that have "issues." Perfect stuff for folks wanting OK wood without having to pay full price.